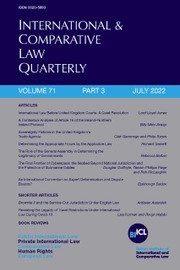 The International & Comparative Law Quarterly (ICLQ) publishes papers on public and private international law, comparative law, human rights and European law, and is one of the world's leading journals covering all these areas. Since it was founded in 1952 the ICLQ has built a reputation for publishing innovative and original articles within the various fields, and also spanning them, exploring the connections between the subject areas. It offers both academics and practitioners wide topical coverage, without compromising rigorous editorial standards. The ICLQ attracts scholarship of the highest standard from around the world, which contributes to the maintenance of its truly international frame of reference. The 'Shorter Articles and Notes' section enables the discussion of contemporary legal issues and 'Book Reviews' highlight the most important new publications in these various fields. The ICLQ is the journal of the British Institute of International and Comparative Law, and is published by Cambridge University Press. DEFINING TERRORISM: ONE SIZE FITS ALL?